The Iranian Air Force (IAF) has officially unveiled the production line of a domestically-manufactured unmanned combat aerial vehicle named Kaman-12. According to Press TV, the production line was unveiled in a Thursday ceremony attended by Vice-President for Science and Technology Sorena Sattari and Air Force Commander Brigadier General Aziz Nasirzadeh in Tehran. The aircraft can fly at 200 kilometers per hour for 10 straight hours. 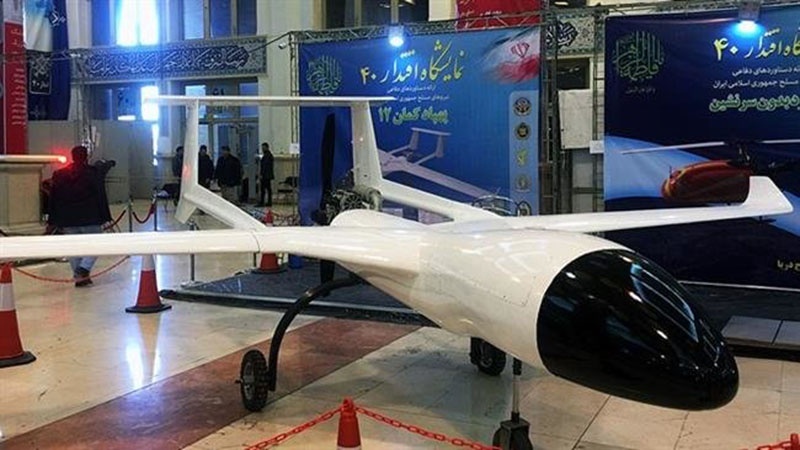 The combat drone was first unveiled on January 30 during Eqtedar 40 Exhibition at Imam Khomeini Grand Prayer Grounds in Tehran, ahead of the 40th anniversary of the 1979 Islamic Revolution. In the field of unmanned aerial vehicles, Iran is now one of the world’s top four or five countries, and the top drone power in the region, according to IRGC Aerospace Commander Amir-Ali Hajizadeh. Iran’s UAV program has expanded in recent years with more than a dozen models operating for a variety of functions ranging from surveillance to intelligence gathering, carrying bombs and Kamikaze operations. They have been playing a significant role in the fight against Takfiri terrorists as well as monitoring US warships in the Persian Gulf. Iran currently possesses the biggest collection of captured or downed American and Israeli drones, including the US’ MQ1, MQ9, Shadow, ScanEagle, and RQ-170 as well as the Israeli regime’s Hermes, Hajizadeh said recently. Separately on Friday, Iran’s Khatam al-Anbiya Air Defense Base unveiled a new radar system called Nasser-40 and a navigation system called Moein-40. Designed and manufactured in cooperation with the Iranian Vice-Presidency for Science and Technology, Nasser-40 radar is a passive radar system which can detect various targets, including Micro Air Vehicles (MAVs) and cruise missiles, in urban environments. Nasser-40 is a stealth radar, and thus cannot be spotted by the enemy’s aerial vehicles, according to Fars News Agency. Only eight developed countries in the world have the technical know-how for manufacturing such a navigation system.